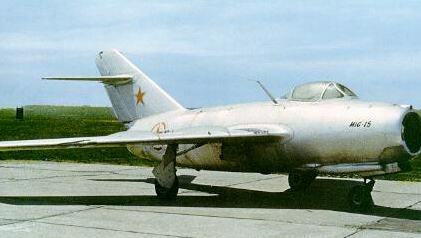 November 1957 The MiG-15 was developed by the Soviet Union following WW II. It began appearing in service in 1949 and by 1952 it had been provided to a number of Communist satellite nations, including North Korea where it was used extensively against United Nations forces. The airplane on display was flown to South Korea on September 21, 1953 by a defecting North Korean pilot who was given a reward of $100,000. The airplane was subsequently flight-tested on Okinawa and then brought to Wright Patterson AFB for additional flight tests. An offer by the U.S. to return the airplane to its "rightful owners" was ignored, and in November 1957 it was transferred to the U.S. Air Force Museum for public exhibition.